On October 29, 2017, Governor Snyder signed LMB’s e-bike legislation into law! This legislation, HB 4781, 4782, and 4783, amends the Michigan Vehicle Code (MVC) to clarify the definition of e-bikes and outlines where e-bikes can be ridden legally on Michigan roadways and trails. E-bike use has grown rapidly in Michigan creating an urgent need to clarify the classifications and regulations surrounding them. Prior to our legislation, the MVC lacked a definition regarding e-bikes, creating confusion for law enforcement over license and operation requirements, as well as for e-bike users, manufacturers, retailers, trail users, and land use managers. The bills, sponsored by Representatives Holly Hughes and Klint Kesto, were introduced in June of 2017. 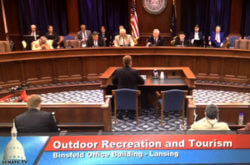 The legislation was crafted through a collaboration between LMB, the Michigan Trails and Greenways Alliance (MTGA), the Michigan Mountain Bike Association (MMBA), People for Bikes, the Michigan Environmental Council (MEC), the Department of Natural Resources (DNR), PEAC, bicycle retailers, and other interested stakeholders. LMB also helped to host a number of e-bike demonstrations throughout the year, including one held during our Lucinda Means Bicycle Advocacy Day in May. LMB testified in support of the bill package at a House Tourism and Outdoor Recreation Committee hearing in early September 2017. The bills passed out of Committee soon after and moved quickly through both the House and Senate. They were presented to the Governor for his signature on October 24, 2017. By signing the bills, the Governor enacted Public Acts 138, 139, and 140 of 2017. The Public Acts (PA) function to spell out the governance of e-bikes.PA 139 defines an electric bicycle or e-bike, as “a device upon which an individual may ride that satisfies all of the following: (a) The device is equipped with all of the following: (i) A seat or saddle for use by the rider. (ii) Fully operable pedals for human propulsion. (iii) An electric motor of not greater than 750 watts.” PA 139 goes on to divide e-bikes into three different classes. Class 1An electric bicycle that is equipped with an electric motor that provides assistance only when the rider is pedaling and that disengages or ceases to function when the electric bicycle reaches a speed of 20 miles per hour. Class 2An electric bicycle that is equipped with a motor that propels the electric bicycle to a speed of no more than 20 miles per hour, whether the rider is pedaling or not, and that disengages or ceases to function when the brakes are applied. Class 3An electric bicycle that is equipped with a motor that provides assistance only when the rider is pedaling and that disengages or ceases to function when the electric bicycle reaches a speed of 28 miles per hour. Beginning January 1, 2018, e-bike manufacturers and distributors must properly label e-bikes prior to their sale by permanently “affix[ing] in a prominent location on the electric bicycle a label that contains the classification number, top assisted speed, and motor wattage of the electric bicycle.” After sale, it is illegal for the classification label to be altered or tampered with in any way. Additionally, “a device shall not be considered an electric bicycle if the motor is modified” in a way that changes its original classification, or increases the motor’s wattage above 750. Class 2 and Class 3 e-bikes are more restricted in their use. They are allowed on “a linear trail that has an asphalt, crushed limestone, or similar surface, or a rail trail if authorized by the local authority or agency of this state having jurisdiction over the trail.” This means a local governing body must give special permission within their jurisdiction to permit Class 2 and Class 3 e-bikes on their trails. All three classes of e-bikes are prohibited on any “trail that is designated as nonmotorized and that has a natural surface tread that is made by clearing and grading the native soil with no added surfacing materials.” This means that e-bikes are not allowed on mountain biking trails. However, again, local governing bodies have the power to permit e-bikes on their nonmotorized natural surface trails. PA 139 also prohibits e-bikes on Mackinac Island, unless an individual has “obtained the required permit from the Mackinac Island State Park Commission”. In compliance with the Americans with Disabilities Act of 1990, individuals with disabilities who use an e-bike as a mobility device may ride on facilities that would otherwise prohibit e-bike use. Finally, PA 140 stipulates that e-bike users are not required to maintain insurance for their e-bike. The laws go into effect on January 28, 2018, 90 days after the Governor’s signature. We would like to thank our collaborators on this legislation including MTGA, MMBA, MEC, DNR and PEAC, as well as everyone who contacted their lawmakers, attended e-bike demonstrations, or otherwise helped drive our legislation forward. We could not have done it without you! Photos, from top to bottom: LMB’s John Lindenmayer testifies before the House Tourism and Outdoor Recreation Committee hearing in support of e-bikes. 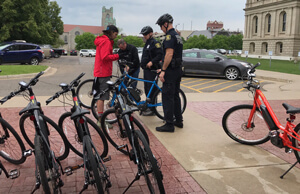 Police officers examine e-bikes at a demonstration LMB’s Bicycle Advocacy Day. 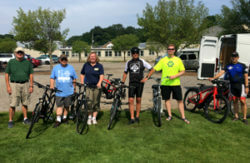 Rep. Holly Hughes at an e-bike ride organized my MTGA and attended by LMB. 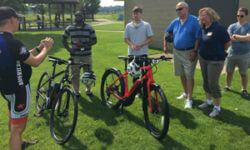 LMB Board Member Michael Reuter demonstrates an e-bike. The Senate votes unanimously in favor of e-bike legislation.